The beast engulfs the victim in its massive, fleshy foot. The victim sits inside its armor, sure of its protection. It hears something scrape against the armor. Then a spitting sound. Then scraping. Scrape. Spit. Scrape. Spit. Scrape. The victim does not know that the beast has a mouth full of acid to weaken the armor and a chainsaw tongue to cut through. The victim – immobilized in what was supposed to be protective armor – has no choice but to be eaten alive as the rasping tongue of the beast scrapes out the soft-tissue of the victim like a knife that scrapes peanut butter from the jar. When finished, the beast opens its fleshy foot and releases the victim. And then you come along and make what’s left of the victim into a necklace and give it to your sweetheart. The beach is a crime scene, littered with the victims of molluskan murder. You or your sweetheart may be wearing one of the murdered on your neck. You know that shell you found on the beach with a perfectly drilled hole in it that you made into a necklace for your sweetheart? That was a clam or scallop or mussel that was eaten alive by a an acid-dripping, chainsaw tongued predator. A predator that is also a murderous snail. Moon snails (Polinces spp.) 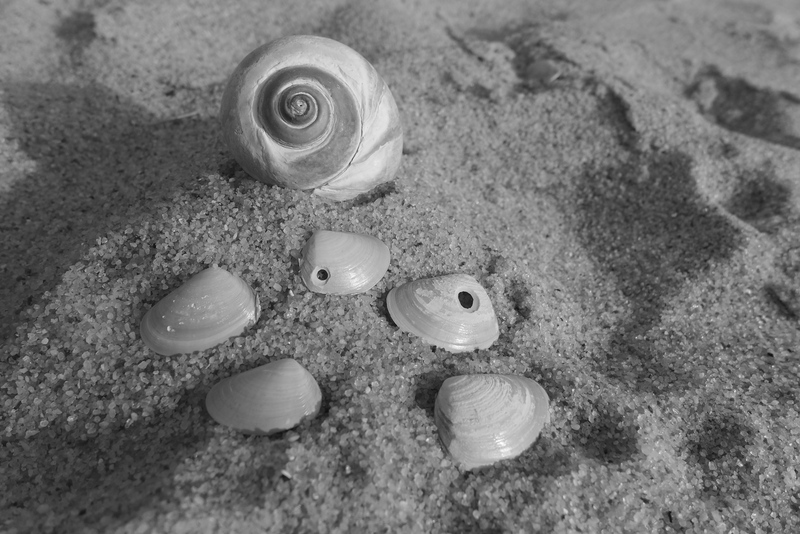 are common hunters in the sands of our shores and seek their molluskan kin for supper. Moon snails are not your garden variety garden snail, which are vegetarians. Moon snails are 100% meat eaters. To hunt its prey, which are mostly clams and other bivalves, a moon snail burrows through the sand and engulf its prey in a fat, fleshy foot. Then the snail opens its chemistry kit and drips a bit of acid onto the clam’s shell to soften it. Then using a specialized tongue called a radula (most snails have radulas) it scrapes away the acid-softened shell. Radulas are snail tongues with backward facing teeth that act like schizophrenic chainsaws that reverse and go forward over and over to scrape algae off of rocks or layers off of shells. The hole is perfect for the tongue to enter and scrape out the soft tissue of its prey. The clam is eaten alive. And then you thread a string through the murder hole to display your lacking concern for the victim. The murderer and the victims in a crime scene from Plum Island, Massachusetts. Coffee-bean snail and wolf spider, Newbury, Massachusetts (don’t ask me why the colors look the way they do). I had to close my eyes to the spray of ice as I slammed the claw hammer into the 3-inch ice that armored the marsh. I use the claw to peel back ice chunks and hunt for life. Ten minutes later I find two winter denizens of the Great Marsh. I de-glove and carefully remove a thin-legged wolf spider (Pardosa littoralis) and a coffee-bean snail (Melampus bidentatus) from the grass stems. They are not dead, but possibly as near as you can get. Their organs are slowed, their metabolism at a glacial crawl. They are, for now, frozen in time. One of them quite literally (and I mean ‘literally’, not ‘figuratively’). All overwintering animals, including you and me and your little brother, have two choices when it comes to surviving the winter. Freeze avoidance or Freeze tolerance. Freeze avoidance usually means finding a shelter for the winter (called a hibernaculum) such as a burrow below the frost line or a shelter with a thermostat cranked to 72 F and stocked Rolos and oatmeal chocolate chip cookies (no. not raisins. raisins belong in only two places: bran and the trash). Freeze tolerance usually means that you’ve got to freeze some-to-most of your body. Some frogs and salamanders and many intertidal molluscs (snails, clams) do this. I will avenge you my brothers and destroy the Evil Empire!!!!! Your slow-roasted deaths shall not be in vain! But what’s wrong with freezing? The biggest issue with freezing has to do with ice crystals that form and ice that expands. Ice crystals are assassins that form inside the cell and use their stiletto-sharp crystals to rupture and kill cells. So whether you’re a freeze avoider or a freeze tolerator, your imperative is to protect your cells. Too many dead cells equals one dead you. 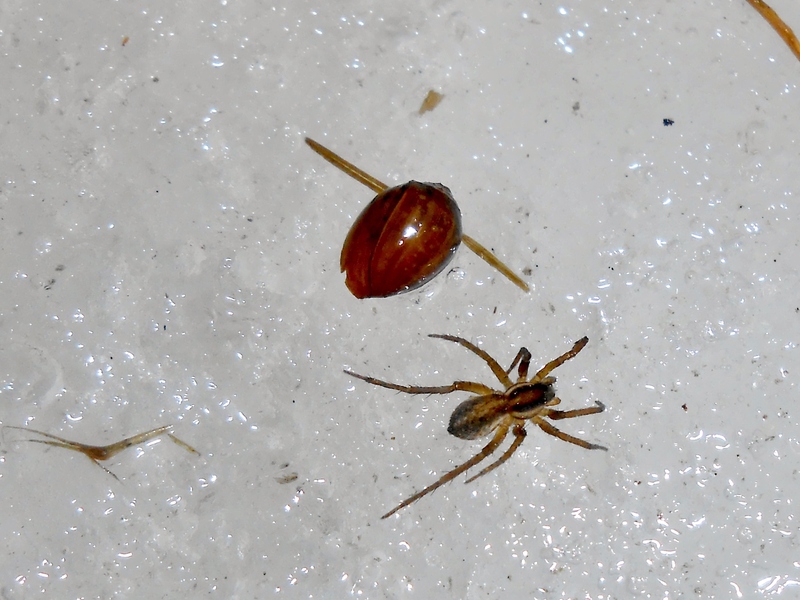 Both the snail and spider are freeze avoiders in terms of their behavior: in the winter they are ‘snuggled’ together under grass clumps that are slightly warmer than the surrounding air. 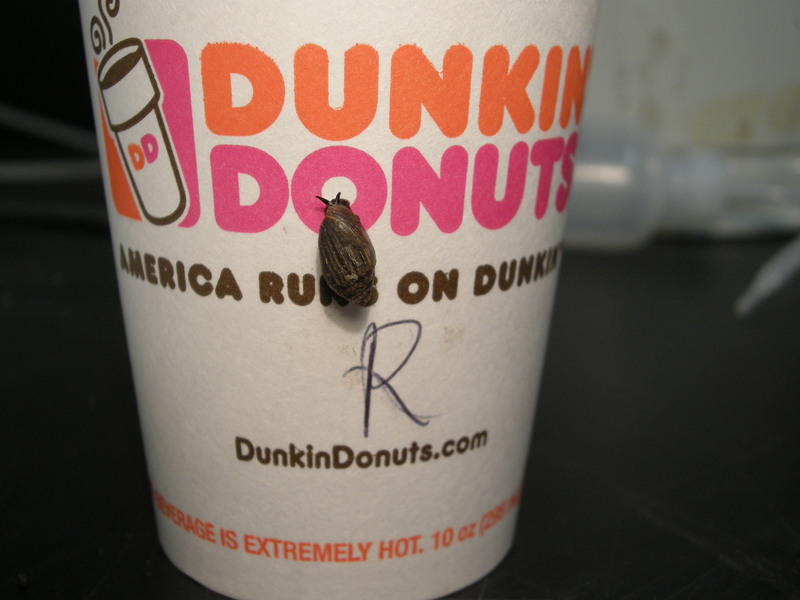 In terms of their internal physiology, the snail is a freeze tolerator and the spider is a freeze avoider. Many insects and spiders (not all) produce anti-freeze compounds (some insects actually produce the same anti-freeze we use in our cars, ethelyene glycol), which lowers the freezing point of their body fluids. At the same time, they will dump sugars into their body fluids which also lowers the freezing point (anytime you dump sugars or salts into water, it lowers it’s freezing point). 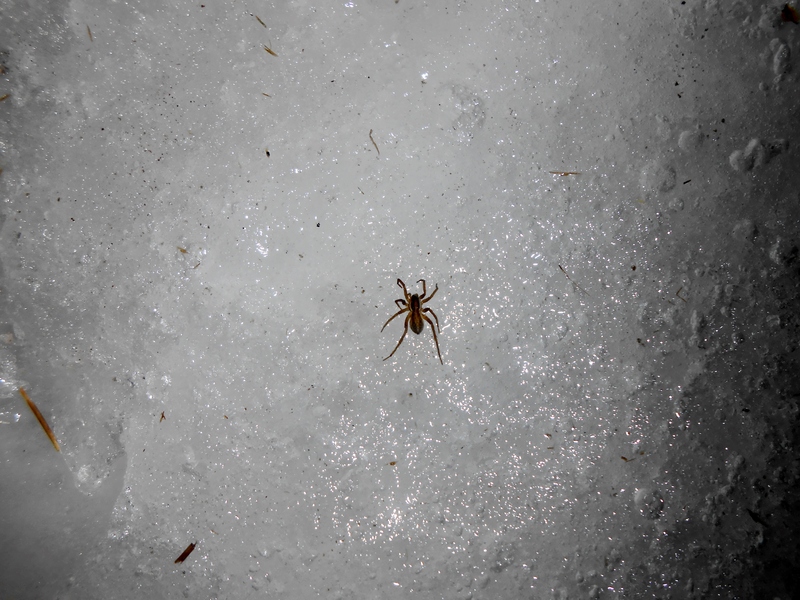 So when it’s 18 F, the spider still won’t freeze though freshwater will. If I hold this spider in my hand long enough or bring him inside, he will eventually start crawling around (though he’ll be really confused and very hungry). 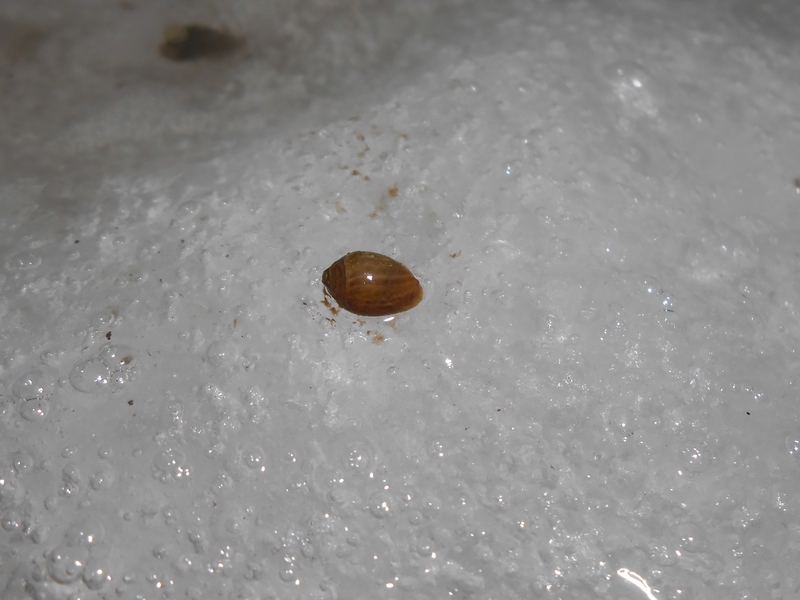 The snail actually freezes part of the body to save the rest. Part of the fluid outside of the cell (extracellular fluid) freezes which forces body salts into the liquid part of the extracellular fluid. This creates an osmotic gradient with higher salt content outside of the cell versus inside the cell. Because Nature seeks balance, the water inside the cell moves out of the cell until the salt levels are equal in and out of the cell. This cell dehydration then increases the salt content of the cell, which in turn lowers the freezing point of the cell. Again, saltier or sugarier solutions have lower freezing points than freshwater solutions. Wood frogs (Rana sylvatica) perform a similar feat and people have claimed to have found ‘frog-sicles’ under logs. The take-home is that the frog, just like the snail, is not completely frozen. It can’t be or it would die. It may, however, be mostly frozen (up to 65% of it’s body liquid) to protect the cells. Most of the cells inside are not frozen despite that fact that the soft bodies of snail and the frog are now hard as rocks. In both freezing strategies, animals are trying to protect their cells and do so by lowering the freezing point of some portion of their body. Thanks to Duley for spending more time than either of us should have trying to craft the perfect snail jokes. And perfect they are!